Appearance: Adults are brownish to somewhat greenish on the dorsal surface with small whitish markings. The marginal band is normally very fragmented, sometimes with a dot representing the end of the middle band. Similar Species: This species is easily confused with Cicindela cursitans. It has more reduced markings and the marginal band is never continuous. Because of their overlapping similarity, they are best differentiated by the habitat in which they occur, as C. celeripes prefers dry upland areas, while C. cursitans prefers low moist areas. Biology: This species occurs in upland grasslands with clay or loess soils and sparse or patchy vegetation. It was reportedly once common on the bluff prairies along the Missouri River. Adults are entirely flightless. Adult Life History: Adults emerge from the pupa mostly in June. Peak numbers usually occur from mid-June to early July. Numbers drop off fairly rapidly and adults are rare by August. It is a summer species. Larval Life History: Nothing has been published on the larval stages of this species. Eggs are probably laid mostly in June and most larvae should reach the third instar by fall before overwintering. Pupation then likely occurs in May of the following year. Larvae probably develop in bare soil areas in grasslands and the larval stages are likely completed in one year. 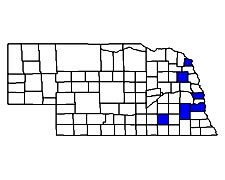 Biogeography: In Nebraska it has only been recorded from six counties in the eastern third of the state. As it has not been recorded from Nebraska since 1915 and much of its former habitat has been lost to agricultural expansion, it may be extinct in Nebraska. It is likely that is has suffered similar declines elsewhere. In North America it species has a limited distribution and has only been recorded from eastern Nebraska and westernmost Iowa to Oklahoma and northern Texas. Because it is only rarely collected, it may be overlooked, and its overall biogeography is only partially known. Its apparent stronghold is in the Flint Hills region of Kansas. Because of its need for specific grassland type habitats and its inability to fly, it is highly susceptible to localized extinction.